È un appartamento appena ristrutturato situato a pochi passi dal mare. Gli ambienti sono spaziosi e luminosi e può ospitare fino a 4 ospiti ,dotato di un terrazzino e di un balcone che affaccia a picco sul porto turistico di Piano di Sorrento. L'appartamento è ben collegato,dal porto di Piano di Sorrento partono barche private per Capri , Ischia e Costiera Amalfitana, inoltre in soli 10 a piedi si raggiunge la stazione di Piano di Sorrento( 3min per Sorrento, 20 minuti per Pompei e 60 minuti per Napoli). Stesso da questa stazione parte un bus ed in 30 minuti si raggiunge Positano. E' il posto ideale per trascorrere una vacanza in pieno relax e con tutti i confort. We enjoyed our stay very much. The view is just lovely and the apartment is a good size and comfortable with everything you need. The apartment is about 2 flights of steps up. Teresa was very responsive and kind. We would definitely consider coming back here. A few helpful notes on the area -- it is about a 15 minute walk to the Piano station on the Circumvesuviana train line to Sorrento/Naples. To the apartment is downhill, back to the station is uphill. It is a 5 minute train ride to Sorrento, but you can also walk there in about 45 minutes. There is a ferry to Capri right from the harbor below -- you are supposed to buy your ticket from someone in the harbor (not on the boat). This is a wonderful area of Italy to visit and we were happy we chose this apartment. Beautiful apartment. Great host. She was very helpful. And did I tell you about the view!! We had an enjoytable stay in this bright and clean apartment with each room having a small balcony opening up to a beautiful sea view. Teresa was a kind host and has furnished her property simply and beautifully with all brand new amenities. It is located in a secure building with friendly neighbors and the view of The Gulf of Naples from the roof is amazing. There is a cafe below with tables outside above the small harbor, perfect for morning coffee or afternoon aperitifs. This is within walking distance to the Piano train station where you can catch the Circumvesuviana to Naples, Pompeii or Sorrento. Although we had a car, we walked easily to grocery stories and the town center, passing small citrus groves along the way. 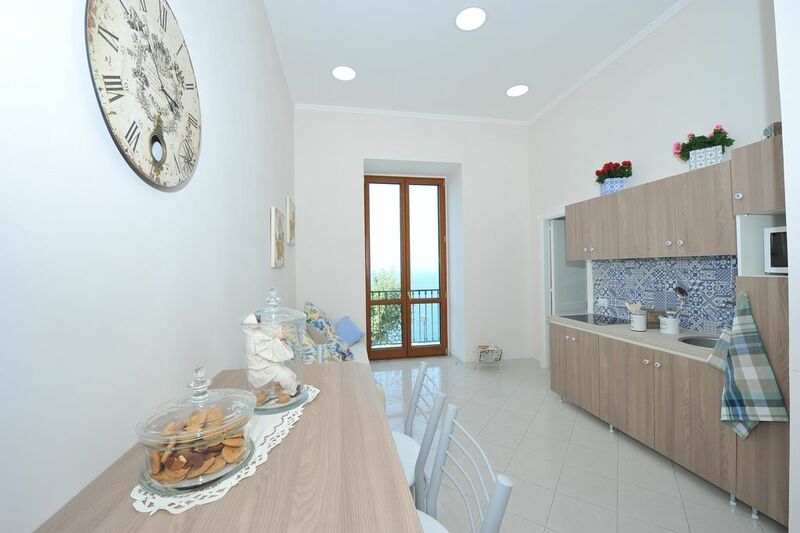 Parking is convenient, close and affordable, unlike downtown Sorrento, and overall we highly recommend staying at the Mavi Apartment in Piano di Sorrento.